The mega ribbon took a full day to install. A huge ribbon and bow has been installed at Westmead Hospital today, kicking off the facility’s 40th birthday celebrations. 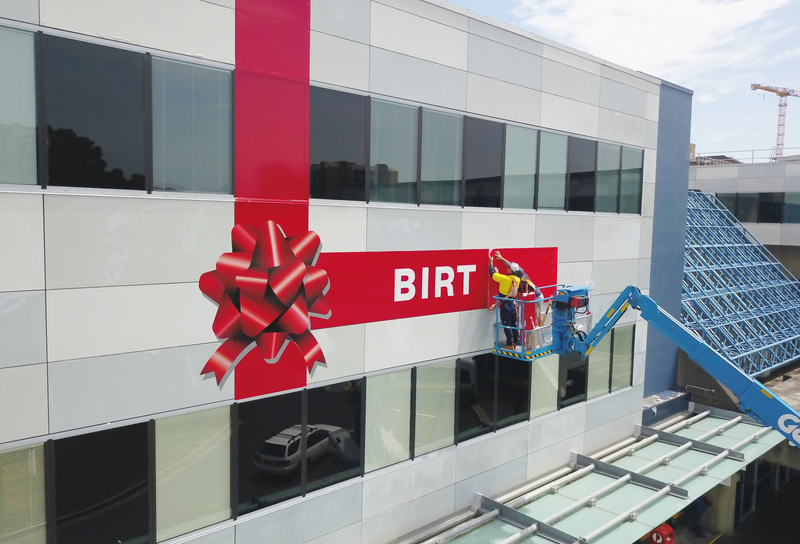 More than 60 metres of red adhesive formed the ribbon and bow installation, which took a full day to install and requiring a specialised lifter to assist sign writers. The sign celebrates 40 years of Westmead Hospital’s history, symbolising the facility being one of the greatest gifts to western Sydney. A present ready for unwrapping. Western Sydney Local Health District Corporate Communications director and chairman of the 40th birthday committee Mathew Nott said the ribbon marks the start of a week of activities to mark the milestone. “The celebrations start tomorrow until Tuesday 13 November with an official birthday and open day to take place this Saturday 10 November,” Mat said. A drone shot of the completed works. The hospital’s birthday and open day will be on from 10am – 3pm on Saturday 10 November. – Health information displays including organ donation, immunisation, how to quit smoking and more. The largest present in Western Sydney takes shape.